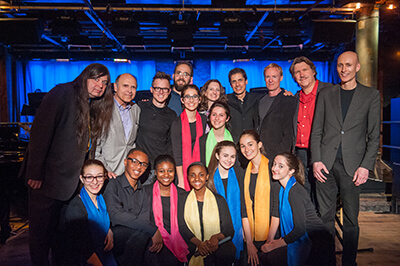 The Young People’s Chorus of New York City has a long history of commissioning and premiering important and exciting works for children’s chorus and to date has commissioned and premiered over 100 compositions. YPC’s first commissioned work dates back to 1996 with There Are (No) Children Here by Morton Gould and Phil Galdston. In 2001, Francisco J. Núñez created YPC’s first commissioning series, Transient Glory, and followed it with Radio Radiance in 2009. Through those two series alone, YPC has commissioned and premiered over 80 pieces of new music by many of today’s most distinguished emerging and established composers. These new works have become an integral part of the repertoire not only for YPC, but also for youth choruses worldwide. YPC is not only expanding the repertoire for young voices but is playing a dynamic role in the ever-evolving fabric of music in the 21st century. YPC Artistic Director Francisco J. Núñez created Transient Glory, YPC’s first commissioning series to encourage today’s most respected composers consider the children’s chorus as a serious and glorious instrument capable of making music of the highest quality during the fleeting period of time when their voices are imbued with a particular poignancy and innocence. Since YPC introduced the series in 2001, dozens of Pulitzer Prize, Oscar, MacArthur, and Guggenheim award-winners, many of whom had never before written for young voices, have accepted commissions to compose for YPC. This “Who’s Who” of composers includes such renowned composers as Charles Wuorinen, Meredith Monk, John Corigliano, Joan Tower, David Del Tredici, and Terry Riley, among dozens more. YPC has recorded three albums of Transient Glory music, the most recent of which is Transient Glory III, named by WQXR as Q2’s Album of the Week. 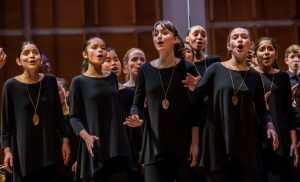 Radio Radiance was created in 2009 by the Young People’s Chorus of New York City to expand the influence of its groundbreaking Transient Glory commissioning series for young voices. The series is designed to excite and challenge the music perceptions of young people with fresh, new musical ideas. Through the Radio Radiance commissions, some of today’s most adventurous composers are redefining ideas of what traditional classical music can sound like by combining new ideas, technology, and the human voice to create new music and new sounds. Through podcasts of this music, young people are able to listen not only in concert halls, but on-the-go, through the kinds of audio technology they use every day: iPods, iPhones, laptops, as well as the time-honored medium of radio. To further participation and appreciation of this new music, YPC invites a select number of high-level regional choruses across the U.S. mainland and Hawaii to take on the challenge of studying, premiering, and even broadcasting a Radio Radiance work of their choice on their local radio stations, often in collaboration with the composers.